In the twilight days of Dubya’s presidency, the new parlor game is wondering who was the worse president: Bush or Nixon? There have certainly been those who have tried, like fly-on-the-wall reporter Bob Woodward of Watergate fame, whose books on Bush have left Woodward seeming less like a star investigative reporter and more like a guy who barely laid a glove on his subject, and a velvet glove at that. The question of who will “expose” Bush presumes that no one has yet got at what makes him tick. He does often appear to have the shallow, flat effect of a dry drunk, a man whose there is so thin as to not be there. A man without Freud or Shakespeare in him, let alone on his book shelf. He wouldn’t be the first president to elude. Try reading biographies of Calvin Coolidge or Franklin Pierce. Or remember Ronald Reagan biographer Edmund Morris who threw up his hands at trying to find his subject’s innards (“He’s still a mystery!”) and who thus decided to fictionalize the president’s inner life because when he scratched Reagan’s Hollywood tinsel all he found was more tinsel underneath? An empty man makes an unworthy villain, and a tedious biography. Nixon was not empty. 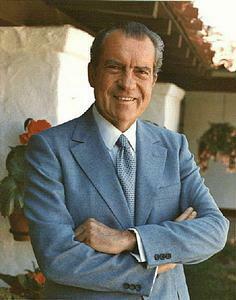 A few months ago, for some reason completely unconnected with the Frost/Nixon movie (which I have not yet seen) I watched several long segments of the original Frost/Nixon broadcast on YouTube and I was struck by how intelligent, reflective, creepy, and self-absorbed Richard Nixon was. No one would ever suggest there wasn’t a there there, even if it was a very scary place. Bad guys with the depth and pathology of Nixon become great characters, villains you can both loathe and sympathize with. Bad guys make the best protagonists. Standing up in defense of Nixon’s villainy was Fox News’ Chis Wallace, who took issue with the claim that Bush is worse than Nixon. 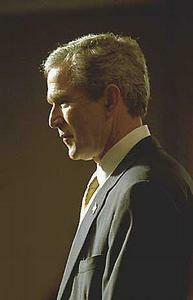 A bristling Wallace said, “To compare George W. Bush to Richard Nixon is to trivialize Nixon’s crimes and is a disservice to Bush….Richard Nixon’s crimes were committed solely for his own political gain, whereas George W. Bush was trying to protect the American people.” In other words, selfish Nixon was way worse than bungling Bush. It’s not exactly a stirring defense of the boss, and Rove leaves out some important data. Bush’s approval numbers have been below Nixon’s a number of times, even Nixon’s impeachment period ratings, but while Nixon may have scored slightly lower in approval, no modern president has scored a higher disapproval rating than Bush, according to Gallup. In other words, his negative numbers were in a zone of his own. Nixon’s willingness to fall on his sword made him both noble and ignoble, a larger-than-life tragic figure, a bad-guy worth remembering. Bush, on the other hand, shows all the signs of being a more destructive president, but also more forgettable as a man. Nixon’s villainy is his saving grace, Bush’s his ticket to oblivion. PS: This just in: A John McCain lawyer says it’s Obama who’s as bad as Nixon. Knute Berger is Mossback, Crosscut’s chief Northwest native. He also writes the monthly Gray Matters column for Seattle magazine and is a weekly Friday guest on Weekday on KUOW-FM (94.9). You can e-mail him at mossback@crosscut.com.